Why Isn’t “Hate the Sin, Love the Sinner” Totally Working? “Hate the sin, love the sinner,” is pretty catchy. But it doesn’t seem to be “working” in terms of certain goals. You’d think it would be the perfect harmony of both tolerance and moral steadfastness. But it’s not really “hooking flies with honey” like one would hope. Gosh darnit, why does it appear to be struggling on these fronts? And when “love” is shorthand for “rebuke” or “repair,” it naturally prompts ultimatums which, in turn, naturally catalyze rifts and/or insoluability. Thus, for the reasons above, in the real world, the quoted imperative is bad in terms of the goals of community, unity, and fellowship. Of course, some folks are aiming for other goals. You can have whatever goals you want. Which goals you actually have — or “should” have — is irrelevant to the above point, and I am not making such a statement here. Methodologically naturalism is the idea that it’s imprudent to invoke supernatural intervention as an explanation when such miraculous intervention may not be necessary. This is a pillar of mainstream science. And how do you determine whether supernatural intervention was necessary for some observation? By assuming, for the sake of argument, that something supernatural did not intervene, and then genuinely attempting to find a sufficient natural (that is, mechanistic) explanation. You live on planet Chalybos, and you’ve been taught from birth that the core of the planet is made of an indestructible substance. You begin an endeavor to search for that indestructible substance. You’re not the first Chalyban to have this idea. 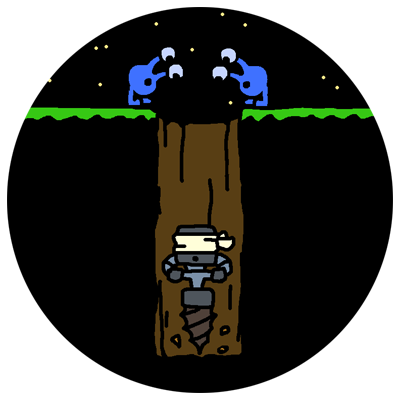 Many people have before begun similar digging adventures. The first such explorer hit a really tough substance 50 meters down. He was convinced that this was the indestructible core. He wailed on the substance for weeks, but it wouldn’t break. Finally, after failing to dig any deeper, he proclaimed that he had, indeed, found the core. Later, a different explorer brought a team along with him. After months of working at the stubborn material, they broke through. The material wasn’t indestructible at all; the core had not been reached. This happened again and again in the history of Chalybos. A team would reach a layer seemingly invulnerable, and proclaim their victory in terms of having discovered the planet’s core. But then a subsequent team would work a little harder and longer and break through what before was claimed to be the core. And then, the cycle would repeat. To deal with this, you decide to build a robot that is programmed to dig downward. Even if the robot hits a surface that he has trouble with, he never gives up. He always treats anything he encounters as if he can break through. In some ways, this robot has a weakness: He is stuck in full-throttle dig-mode. He has no perceptions and no decisionmaking faculties. Furthermore, if indeed he does hit the true core one day, he’ll continue digging into it, fruitlessly, forever. In other ways, this robot has a strength: He will never give up too soon and falsely proclaim victory, as so many explorers before you had done. Seeing this repetitive pattern of false victories and deeper digs, some conclude that there is no indestructible core at all. There is only an “indestructible core of the gaps,” shrinking every time a team breaks through and digs deeper. Can you see the reasoning behind the skeptics who reject the idea of an indestructible core? Can you see the reasoning behind those who believe the core has been found, but refuse to disconnect the robot? And can you see the reasoning behind those who believe the core has been found, and thus the robot should be disconnected? I can see the reasoning behind all of these perspectives. None of them are completely meritless nor certainly meritorious. Methodological naturalism is like the relentless robot. It chews through superstition and baseless supernatural conjecture. Layer after layer, it refuses to quit. To some, this is evidence that there’s no indestructible core at all, that is, there is nothing in existence that does lacks an mechanistic and explanatory underpinning. But I don’t think that necessarily follows. Methodological naturalism is a preference heuristic, not dogma. I say, “keep the robot going,” while simultaneously putting faith in a God who I believe has interacted with my life in a meaningful, powerful, and efficacious way. This is what Stephen Jay Gould meant by “non-overlapping magisteria.” My beliefs about the core are orthogonal to the activity and revelations of the robot, though they are updated if and when the robot forces it. “Quiet theology” means practicing theology through philosophical quietism, where philosophy is meant to be more remedial than exciting. As such, it is about treating conjecture like conjecture, being willing to say “Nobody actually knows,” and finding and tackling language problems that have been causing confusion and miscommunication. The word “orthodox” represents one such confusing language problem. Note: This is about the semantic difficulties with the word “orthodox,” and not an attack on the Orthodox Church, and not intended as a specific doctrinal indictment. Does it have logically coherent premises and does it proceed from those premises? If it has one or more naturalistic premises, are those premises consonant with science? Is or was it popular among acknowledged authorities? Is or was it popular within the Church generally? These are in priority order. For example, its historicity is unimportant if its apparent cogency was based on bad science. Its popularity, even among the respected intellectuals, is unimportant if it can be shown the doctrine does not logically follow from coherent premises. But we’ve just put questions of logical validity and — if science is invoked in the claim — scientific consonance above questions of historicity and popularity (that is, tradition). In other words, it is quite possible that there are various doctrines that are orthodox but heterodox. I’m confident that we can all agree: It’s not impossible for this to be the case for some doctrines. And we know that, as language is mutating, more problematic nomenclature is developing. “Unorthodox,” for example, means “breaking with tradition, often with overtones of creativity and new insight.” Good gravy! If we were to fix this language problem, we’d add a second qualifying dimension, and perhaps come up with a couple of new terms. So we’d have “orthodoxy,” true doctrine, as opposed to “pseudodoxy,” false doctrine. 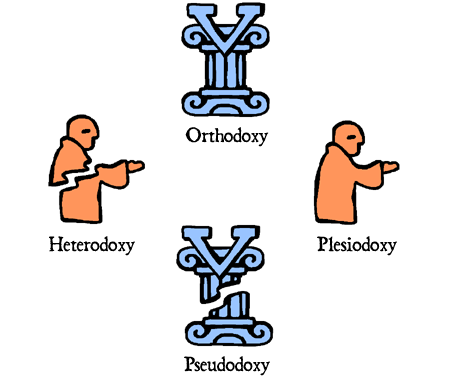 And we’d have “heterodoxy,” different than our tradition, as opposed to “plesiodoxy,” near to our tradition. The problem is that this remedy cannot be administered retroactively. The Church Fathers did indeed consider orthodoxy and heterodoxy dichotomous and single-dimensioned. Tradition was extraordinarily vital for preservation of the faith. Why was it vital? The Fathers were dealing with three issues: Antiquated philosophy, false science, and logistical challenges. Early theologians were not that great at answering question #1. Early theologians were really bad at answering question #2. This isn’t to prop ourselves up as superior giants. It’s to merely admit the fact that when we stand on the shoulders of giants, we are net-taller than giants. We have post-Enlightenment philosophy. We have pivotal scientific discoveries from the 19th, 20th, and 21st centuries that have eliminated mistaken assumptions about how organisms operate. And so on. Listen. Aristotle was smarter than you or I will ever be. But he also thought air, fire, water, and earth were elements. We’re not boasting; we just have better tools. And it’s not like we built those tools ourselves. We received them as Christmas presents, for heaven’s sake. Lacking those better tools, the ingenious progenitors of our theology did their best with what tools they had. Questions #3, #4, and #5 had primacy. “Don’t tolerate teachings other than the ones you received!” was the constant refrain from Fathers like Clement of Rome and Ignatius of Antioch. But tradition is notoriously dynamic and volatile, especially given the logistical difficulties of the era. So the early Fathers — even up to the Apostles — came up with a way to settle it down. By metaphor, the Hat of Approval is the deference given to the hierarchical authority of the Church, especially that which is expressed in Council decisions. We see the roots of “pleisodox/orthodox” conflation take root as a product of this logistical necessity. It’s not perfect, but it was almost certainly necessary. And that appears to be the seed that, down the road, blossomed into our current semantic confusion. Create new nomenclature completely (like in the four-pronged diagram above). Abandon the remedial project and stick with what we have, and wherever it’s going. All three options will catalyze all sorts of communication problems, but of different kinds. I apologize for the sad ending. Confident, “100% upside” direction is often preferred by folks in general, even if it’s untrue. An argumentum ad absurdum — I’ll call them “absurdums” for short — is when you argue against someone’s claim X by showing that, if X was true, something obviously absurd would also be true. Lisa and George are watching it rain. “Gross, rainy weather lately,” says Lisa. “How cold do you think it is out there?” asks Lisa. “Maybe 25, 30,” replies George, speaking Fahrenheit. Pretty straightforward, right? It’s absurd that they’re both hallucinating the rain, and so it mustn’t be 25-30 degrees; 32 is the freezing point in Fahrenheit. Just as George guessed, it was 29 degrees outside. “The thermometer must be broken,” said Lisa. “Let’s check the one we have on the front porch.” But, sure enough, the front porch thermometer said 29, too. Same with the thermometer just outside the kitchen window. It turns out that, from the outset, Lisa was unaware of the fact that temperature can vary in different layers of atmosphere. If it’s warmer above the surface, rainfall may not have time to freeze before hitting the ground, even though it’s passing through a sub-freezing layer. 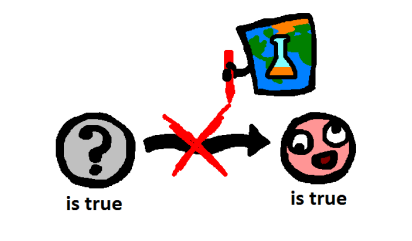 In other words, learning more about how the world works and doesn’t work can make the difference between an absurdum being thought false versus true. That’s an obvious one, but non sequiturs are often very subtle. Recognizing non sequiturs where they exist can also make the difference between an absurdum being thought false versus true. My permanent record contains many infractions for criminally using non sequitur absurdums and then repenting therefor! Earlier, I wrote about a specific kind of non sequitur — where you think the world is “too rocked” by a world-rocking revelation — and called it “Kochab’s Error.” Check it out! Kochab’s Error is often used in an attempt to argue ad absurdum. Okay, okay, we’re actually going to be reading excerpts from Polycarp’s letter to the Philippians. But his words reach through death and time and culture, giving us advice today about avoiding the [g]ospel of “money, prestige, image, security,” and how [G]ospel-followers ought react to this [g]ospel and the followers thereof. ‘But the love of money is the beginning of all troubles.’ Knowing, therefore, that ‘we brought nothing into the world, nor can we take anything out,’ let us arm ourselves with ‘the weapons of righteousness,’ and let us first teach ourselves to follow the commandment of the Lord. I have been deeply grieved for Valens, who once was an elder among you, because he so fails to understand the office that was entrusted to him. I warn you, therefore: avoid love of money, and be pure and truthful. ‘Avoid every kind of evil.’ But how can a man who is unable to control himself in these matters preach self-control to someone else? If a man does not avoid love of money, he will be polluted by idolatry, and will be judged as [those] who are ignorant of the Lord’s judgment. Therefore, brothers, I am deeply grieved for [Valens] and for his wife; may the Lord grant them true repentance. You, therefore, for your part must be reasonable in this matter, and do not regard such people as enemies, but as sick and straying members, restore them, in order that you may save your body in its entirety. For by doing this you build up one another. For I am convinced that you are all well trained in the sacred Scriptures and that nothing is hidden from you (something not granted to me). Only, as it is said in these Scriptures, ‘be angry but do not sin,’ and ‘do not let the sun set on your anger.’ Blessed is the one who remembers this, which I believe to be the case with you.